Please note that the content of this book primarily consists of articles available from Wikipedia or other free sources online. 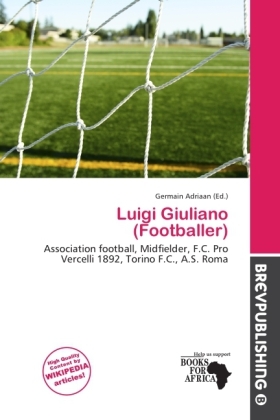 Luigi Giuliano was an Italian professional football player. He had a distinction of scoring in each of his first 3 Serie A games in the 1948/49 season. He was the only youth team player who was playing regularly on the first squad of A.C. Torino, however, because of the delay he had in obtaining the passport he did not make the trip to Lisboa which lead to the Superga air disaster, in which the first squad perished. His last two seasons with A.S. Roma were hampered by serious knee injuries, but that did not stop him from playing on the team that won the 1960 61 Inter-Cities Fairs Cup, he scored a goal in the competition against Union Saint-Gilloise and played in the final.